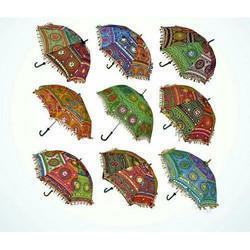 We offer the appealing Fancy Umbrella to the customers. The Fancy Umbrella adds on to the glory of the wedding. Our Fancy Umbrella is high on demand in the market. Party umbrellas with delicate embroidery, mirror and patch work are available to give a personal touch to your wedding decoration. The embellishments and hangings make these umbrellas look very special and exclusive. This is our very exclusive range of Umbrellas. We are supplying Embroidered handicraft Umbrella for Wedding. We offer these in various specifications and can be properly customized as per the specifications provided by the clients. Usage/Application: use as Wedding Decoration,home decor,unique umbrella,fashion umbrella for girl and ladies. Color: Red, Golden, Blue, Yellow etc. Saudeep India's exclusive wedding or event umbrella. This is very adorable and demanding umbrella.